Location: Green Life Family Apartments (ex. 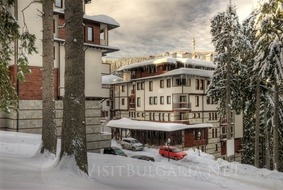 Evridika Hills) is situated at a walking distance from the ski run 7 in the southern part of Pamporovo mountain resort. The hotel is located 300 m away from the Studenets ski centre and about 1.5 km away from the resort centre where the bus-stop, shops, polyclinic and pharmacy are located. Accommodation: The complex consists of two 6-storeys residential buildings - Villa Amata and Villa Orpheica. The hotel features 86 apartments in both buildings – double rooms, studios, one bedroom apartments and two bedroom apartments. The apartments feature balconies with a panoramic view at Pamporovo or Snezhanka Peak and the Television tower. The one-bedroom and two-bedroom apartments have a fireplace in the living room. All the apartments feature fully equipped kitchenette and a separate ski-locker. - 24-hour security service and maintenance of apartments, buildings and on-site facilities. The hotel offers all necessary conditions not only for recreation, sport and various amusements but for holding of conferences, seminars, and children holiday as well. Pets are allowed inside the hotel.